Probably, every one of us knows this The Frog Princess story. There are many versions to this classic story. This one is new, interesting and a modern version of the frog princess. 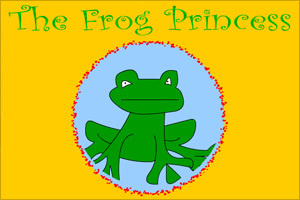 The typical frog princess is all about a beautiful princess who becomes a frog when cursed by a witch. To get out of the curse, she needs to be kissed by a prince. Here, the story is different and animated with a few additions. A girl called Joy, the princess in the story, decides to go to a witch’s school for summer camp. She messes up and things go terribly wrong. Yes, she turnes into a frog. She needs to find a prince to become a girl again. She takes the witch’s cap, broomstick, and many other things and sets out on her search for the prince. She encounteres many obstacles on her way and tries to overcome them one by one. She keeps a lookout for the prince to kiss. She sees a policeman in a smart uniform. Is the policeman the prince the frog is looking for? Does she get back her original form? Watch the story fully to know the rest of the story. There is an interesting twist in the story which will amuse you. This story does not come as a video. It rather comes as a slide show with scripts and audio. However, it still is fascinating to watch.